Overlay Hinges fold into each other. Two hinge leaves that fold or lay into one another to reduce overall thickness and produce an Overlay Hinge. 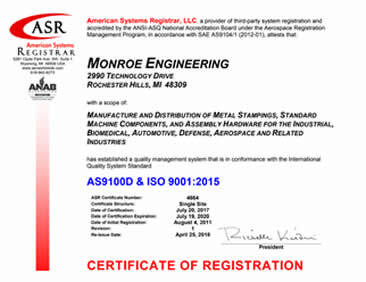 Monroe Hinge & Stamping Company is ready to work with you on developing the right overlay hinge for your application. All of our overlay hinge projects start with a question, a print or a sketch. We are ready to provide you with the support your need to complete the design and manufacturing and delivery of hinges for your project. We are ready to provide you with the support your need to complete the design, manufacturing and delivery of hinges for your project. Are you looking for Overlay Hinges? Monroe Hinge is your source for custom and off-the-shelf hinges. We have robust manufacturing capabilities with the ability of fabricating your custom hinges.